Huge powder at Vail on Sunday (Vail Mountain Facebook photo). Vail was pounded with 28 inches of new snow over the weekend, and forecasters are calling for the Vail powder days to keep on rolling. “The snow just won’t stop as we’ll see potential powder days on Tuesday morning, Wednesday afternoon, Thursday morning, and next Sunday/Monday,” Opensnow.com meteorologist Joel Gratz wrote on Monday, Jan. 18. So far this season, Vail has had 173 inches of snow fall on its slopes, which is nearly half its average annual total with nearly three months of ski season still on tap. 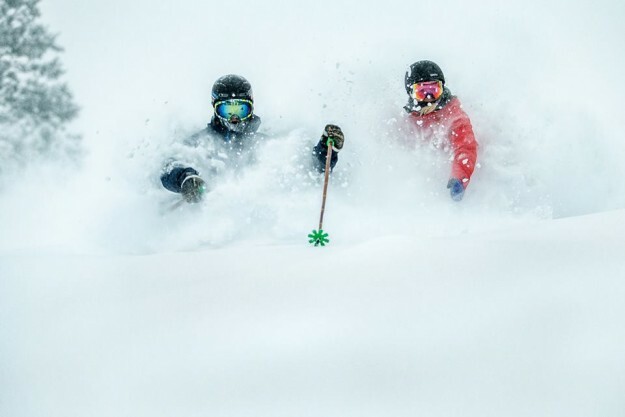 That’s more than 14 feet of snow so far this season, with no sign that the snow gods will stop smiling anytime soon. All 31 lifts are operating, and 191 of its 195 trails are open at Vail. And Beaver Creek has been nearly as good, with more than foot of new snow in the last week and 156 inches so far this season. Huge crowds hit the slopes for the long Martin Luther King Jr. holiday weekend, with cars parked along the frontage roads in both directions out toward both East Vail and West Vail on Sunday. Those crowds should diminish during the week and allow for shorter lift lines during the next few powder storms. Inspired by the Norse goddess of winter, Vail Mountain will host SKADI Fest, an inaugural women’s ski event. From January 20-22, 2016, female skiers will be treated to customized on-mountain guided experiences with female instructors, evening VIP events, and female-specific ski equipment demos. United by a passion for skiing and the outdoors, SKADI Fest is an event designed by women for women and is offered for any level of skier. On February 6-9, 2016, CarniVail returns with more New-Orleans-style fun and Mardi Gras merriment. From a crawfish bowl to a Fat Tuesday Parade and Street Festival, CarniVail adds spice to the wintery atmosphere at Vail. The 34th Burton US Open Snowboarding Championships will be held at Vail on February 29-March 5, 2016, bringing the world’s best snowboarders to Vail for a chance to claim the title in Halfpipe and Slopestyle. After watching Olympic-level competitors, enjoy free live concerts in Vail. Taste of Vail returns with an iconic line-up of tastings and events from March 30-April 2, 2016. An early-booking offer on lodging and tickets is available through December 31, with saving up to 20 percent on the Taste of Vail Signature Pass. Pink Vail™, on April 2, 2016, is the world’s biggest ski day to conquer cancer. Enjoy live music, a costume contest, themed deck parties and the Celebration Ski Down on Vail Mountain. All ages and abilities can participate, and skiing is not required. 100 percent of the proceeds benefit patient care and survivorship programming at Shaw Regional Cancer Center. To get involved, visit www.pinkvail.com. Celebrate the end of another terrific season with a closing-day extravaganza. Spring Back to Vail, the annual spring bash celebrating the close of the winter season, returns to Vail for its thirteenth year. In 2016, SBTV will pack all its power into a one-day, closing day event that is sure to create a positive, long-lasting memorable experience for our guests. Enjoy a jam-packed day of action including the World Pond Skimming Championships, live concert, sponsor Expo Village, an on-mountain luau, aprés parties, giveaways, and so much more. End the season in style with some serious fun under the sun at Spring Back to Vail. Take advantage of mid-season mountain conditions and mid-season pricing on lodging with the Mid-Season Savings Lodging Deal at Vail. Offer valid until March 10 on stays from January 18-March 11. Vail Resorts is making it more convenient and affordable for skiers and snowboarders to purchase daily lift tickets to its 10 U.S. resorts: Vail, Beaver Creek, Breckenridge and Keystone in Colorado; Park City in Utah; Heavenly, Northstar and Kirkwood at Lake Tahoe; Afton Alps in Minnesota; and Mt. Brighton in Michigan. EpicDay Lift tickets offers advance or up-to-the-minute lift ticket purchases through an easy-to-use online and mobile site, www.snow.com/epicday. When purchased in advance, lift tickets can be picked up at a designated EpicDay Express Ticket Pick-Up lane at each resort. Once the ticket is picked up, guests can keep their ticket and load it with more days online, avoiding a return trip to the ticket window. EpicDay Lift Tickets rewards advanced planning, even if the purchase is made while walking up to the resort, with the lowest price guaranteed and less time spent in the ticket line.